I love reading books on mythology and books centering on Ramayana and Mahabharata are my favorite. There is something about these epic sagas that make them really interesting – you see they are never too old or out of date. Today, I am here with the review of yet another Ramayana centered book. 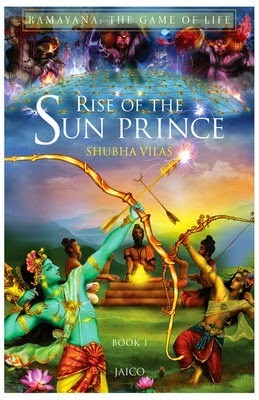 It is ‘Rise of the Sun Prince by Shubha Vilas’. The cover is attractive, I must say. This is another of those book reviews that should have been here months ago. But, give it to ‘the-so-many-other-things’ in life, it got indefinitely delayed. And finally today it is up here. “Ramayana: The Game of Life (Book 1), one of the world's great literary masterpieces, skillfully retold for modern audiences. Epics like the Ramayana have been recounted infinite times. Is there a need for another chronicle in the presence of so many? How is this one different? And is it relevant to our ever-changing modern lives? Any author who aims to recount this epic saga must have tremendous courage, for this is a saga of epic proportion that has been retold several times by several authors in different ways. So, how does one present the same story to the readers in a new way and grab their attention. Tough job it is! Keeping that in mind, I think the author has done a great job with his first book of the six book Ramayana series. This one deals with the Bala Kanda of Valmiki Ramayana. One gets to know how Valmiki starts to write the Ramayana, how Dasaratha came about to have three hundred and fifty three wives, how all his sons were named, what was Viswamitra’s role in Ramayana, the story of Ahilya and of course, every tiny bit details about the lives of Rama & Sita. There is so much to know and learn. When you read the book, you will realize that Ramayana is not just about Rama & Sita or Rama’s war with Ravana – there is so much more to it. The author is not just recounting the story in this book; he is also revealing how the various lessons that Ramayana imparts is of significance in our lives today. There are foot notes on every page does the job. But, they are also the ones that often mar the flow in the story. I am not a very big fan of this style, but I guess the author was left with just this option. Sometimes, the foot notes were too long and detailed that I almost forget where I left the story! I guess, keeping them short, simple and to the point would be better. Overall, it was a great read. If you are a mythology books fan, you can surely pick this one. Some pearls of wisdom from the book.